New decaffeinated, vegetarian friendly, 2 formula Thermogenic for weight management, now to be sold in GNC’s top performing 1900 stores nationwide. NewHealth Solutions, the premiere supplier of the breakthrough weight-loss supplement, pAGG (which is an acronym for its ingredients), is pleased to announce that it has just signed an exclusive reseller deal with GNC to offer the product online and in approximately 1,900 stores nationwide. 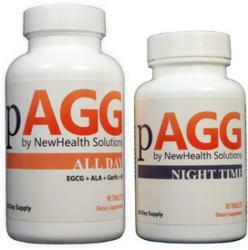 The pAGG dietary supplement was made famous when it hit the cover of Woman’s World Magazine in October of 2011. NewHealth Solutions has parlayed the success of it’s product and the Woman’s World Magazine exposure into a sponsorship on an NBC Reality TV Show titled "Put Your Money Where Your Mouth Is." The product is expected to be available in stores in March 2012. NewHealth Solutions’ pAGG Stack uses naturally occurring ingredients that are decaffeinated, naturally occurring and vegetarian friendly. The formula captures five ingredients individually chosen based on scientific research for their fat-loss and health benefit potential. The five ingredients include policosanol to support healthy cholesterol levels, alpha-lipoic acid (ALA) to support antioxidant regeneration, decaffeinated green tea with high EGCG potency to support metabolism, aged garlic extract to support cardiovascular health, and biotin to help maintain energy levels.